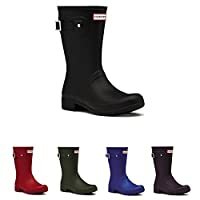 Luckers rain boots run one size larger, it fits comfortably if you wear it together with a rain boot liners, but if you prefer not to, one size down will fit perfectly. Size run measurement(insole length): size 6:9.6", size: 7:9.9", size: 8:10.2", size: 9:10.6", size: 10:10.9" Fleece boot liner not include. Glossy rubber upper and flexible grip sole. 100% waterproof! Cotton lined, thin cushion insole, lightweight, foldable and portable. 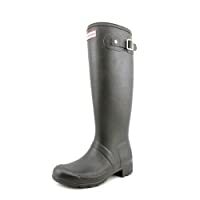 Shaft measures approximately 10.5" from arch, boot opening measures approximately 14" around. 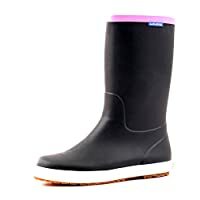 Heel measures approximately 0.5"
It's natural if you find your rain boots have white fog layer on them and that it can be wiped off with a damp cloth. This "blooming" formed when the boots are exposed to extreme temperature, and it helps prevent the boots from weathering. 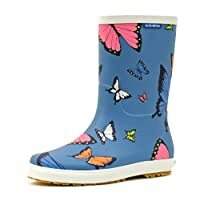 Luckers rain boots run one size larger, it fits comfortably if you wear it together with a rain boot liners, but if you prefer not to, one size down will fit perfectly. Size run measurement (insole length): size: 2:8.5", size: 3:8.9", size: 4:9.3", size: 5:9.6"